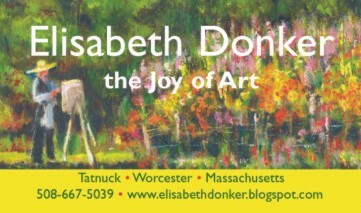 During the late seventies I took some painting classes at the Worcester Art Museum. My teacher was the famous Robert Douglas Hunter. I have a small collection of his paintings and some prints in my studio. This man inspired me to look at composition, color and shade. " 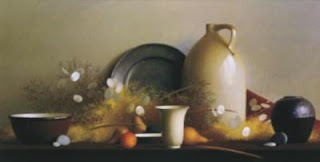 Mr." Hunter was teaching still lifes and is most well known for his long-table compositions. During these sessions with Mr. Hunter I met a number of people that some thirty years later are still good friends. Below is a painting I borrowed from public domain and further down this page is one from my own collection. See more of Mr. Hunter's work here.